If you are like me, you are always slightly annoyed when NHL Central Scouting puts one four separate rankings for one draft. Thus, each year I take on the cumbersome task of combining the lists. It takes about an hour to combine the lists, but two days to add the stats and other pertinent information. For the first round I took the average of four separate December/January draft rankings and inserted the player from the European or Goalie rankings where the average ranking suggested. For the remaining rounds, I simply inserted 5 European skaters and 3 goalies per round based on the average for the 2011 and 2012 drafts. It is a little early to say who is right and who is wrong with their rankings so I will just list those prospects who I was surprised to see how high they were on Central Scouting’s lists and also those I was just as surprised to see how low they were on the lists. 10 – Frederik Gauthier: I don’t dislike this ranking but I am kind of surprised that NHL CS has him this high, so early, when he still has so much to work on and you are uncertain as to how much of that vast promise that he will be able to deliver. 17 – Mirco Mueller: Again, it is not so much that I disagree with this ranking; it is more that I would like to see this guy deliver the promise he showed at the U20’s to the Dub on a consistent basis before I jump all-in like CS. 23 – Shea Theodore: Has the skills but for me the defense is missing. 39 – Jimmy Lodge: I have watched this guy a few times; he has some offensive skills but the complete game is not there for me. 45 – Zach Nastasiuk: Has been on a roll and mostly downhill; did not have a great Top Prospects game. 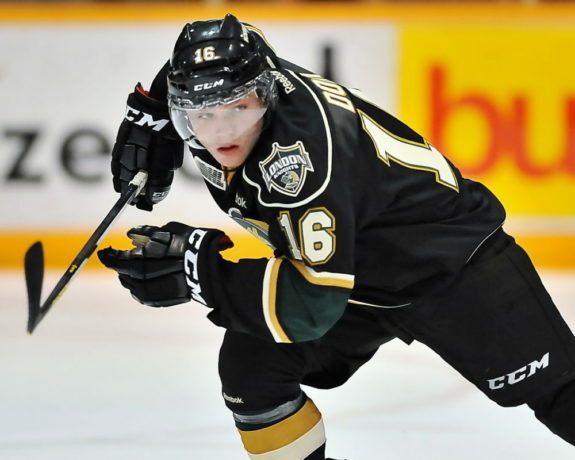 31 – Max Domi: Tie is not going to be happy with this ranking for sure; for me, Max is a first rounder. 42 – Nikita Zadarov: I guess CS and I watched different games. 70 – Keaton Thompson: 2nd round, I can buy; 3rd round, not so much. 93 – Ryan Kujawinski: I am not sold on this guy either but 4th round seems a bit rough. 105 – Samuel Morin: Raw but he is 6’7, can be a bit mean, can skate fairly well, has reasonable skills – 2nd round for sure for me. Peruse the combined rankings below and comment on some of your projected outliers. The table display approximately 30 of the prospects at a time; simply scroll down to view the other prospects. Only a portion of the table displays by default; you can scroll over to see the rest of the player demographics and stats or select “View full-size workbook” option, which is the icon in the bottom right hand corner, to view the full table. *This article was originally published at The Hockey Writers.